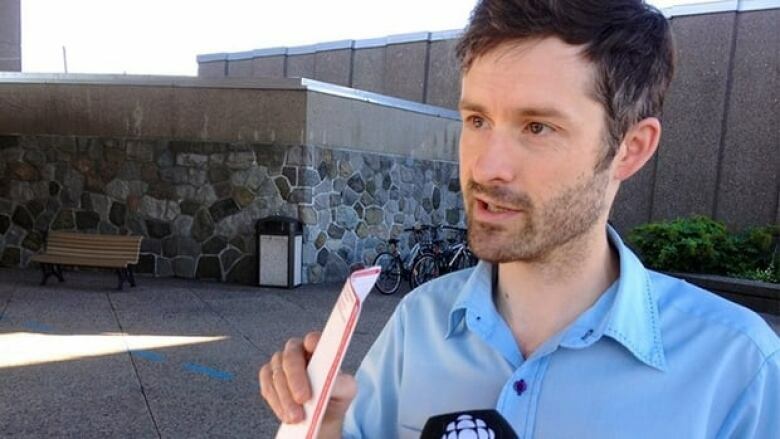 Cyclist Chris Lloyd says he was just trying to help other commuters when Montreal police issued him a $651 ticket for obstructing a peace officer yesterday morning. After riding through a red light at the intersection of Duluth Avenue and Saint-Hubert Street, Lloyd received a $40 ticket from police monitoring cyclists during rush hour that morning. Did the cyclist deserve a ticket? Lloyd said he was just trying to help fellow cyclists. But police didn't see it the same way and gave him a ticket for obstructing a peace officer. "I think just warning people, even if I was saying, 'There are police just on the other side of the lights,' it's not interfering with their work because their work, the goal of their work, is not just giving tickets," says Lloyd. Montreal police said they do not comment on individual cases. Criminal defence lawyer David Sutton told CBC's Daybreak the incident doesn't seem to fit the common application of the law prohibiting the obstruction of police work. "I think the police have come up with a very generous interpretation of the notion of obstruction under any piece of legislation," he says. "If a person were to alert a member [or] members of the public to a covert police operation and show how it interferes with that operation, that would be obstruction. This good person was really just encouraging other cyclists to obey the law." Though Lloyd says he will not contest the ticket for running the red light, he will fight the charge that he obstructed police. Did this cyclist deserve a $651 ticket?